I don’t rave about too many appliances, but I absolutely love my Crock-Pot. I honestly used to be a little afraid of it, This Is Us-style, until a considerable number of fire-incident-free uses convinced me that I had nothing to lose and everything to gain by embracing Crock-Pot life. This especially came in handy when the kids were little: I could throw dinner like chili or pot roast in the magic appliance first thing in the morning. All day long I’d be like the lady in the old Easy-Off commercial who swung a tennis racket as she beamed, “I’m cleaning my oven!” Except mine was, “I’m cooking dinner!” as I swept up toys or finally got the kids down for naps. I never got all fancy about it, like one of those huge ones with timers; my Crock-Pot was $25 when I got it on sale at Target. To be clear, these were not gourmet years: I favored recipes with as few ingredients as possible, like pulled pork with barbecue sauce or slow-cook Manwich sloppy joes (I know). And somehow in my frequent Crock-Pot recipe searches, I came across this dish, what Takeout editor Kevin Pang instantly dubbed Gwen’s Garbage Chicken Deluxe. It has four ingredients (two of them processed food products), takes about five minutes to throw together, and was something even my kids would eat, every time. I don’t even remember where I originally found it, but am forever grateful to the convenience casserole mastermind who cooked this up. I can trace it back to my love of stuffing even on days that aren’t Thanksgiving, but this dish saved my dinner plans any number of times. Just throw some frozen peas or a salad on the side and you’re done. I even made it for some friends who came over for dinner one night; almost everyone who tries it is a huge fan. It would be like turning down Pringles, or Cap’n Crunch (it’s probably about that good for you, but awfully satisfying at the time). 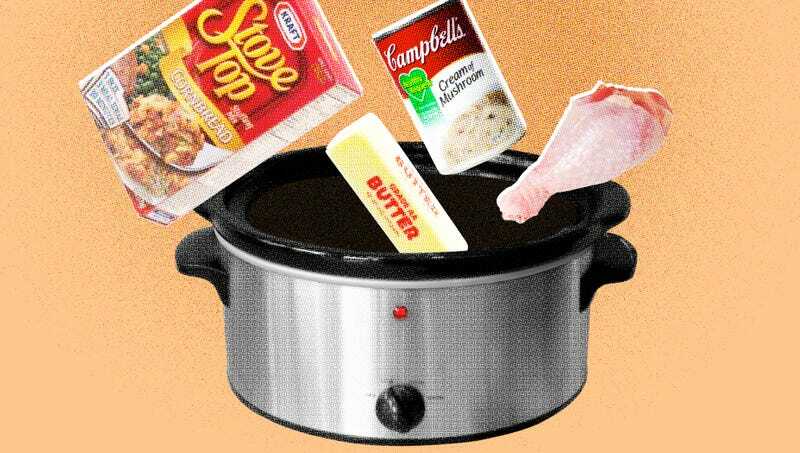 Those four ingredients: a stick of butter (melted), a pound of boneless chicken, a box of Stovetop stuffing, and a can of mushroom soup. That’s it. Yes, it’s impossible to make it look like anything other than an unappetizing pile of brown in these photos (believe me, I tried), but something about the combo—and maybe the MSG—triggers my brain in a very happy way. If you’re not afraid of the middle grocery-store aisles and wish Thanksgiving dinner came around more than once a year, give this a try. Pour the melted butter over the bottom of the Crock-Pot. Add chicken next, making sure it touches the bottom. Then add undiluted soup and the box of stuffing. Cook for about five hours on the low Crock-Pot level or three on the high level, until the chicken is at 160 degrees. When the chicken is done, shred with two forks and mix entire concoction together to combine..